Download a new language directly from your Back-end Panel by going to Extension >> Manage >> Install Languages. Enter the desired language (e.g. "German") in the Search field and click Install button. You will see a message saying the new language has been installed successfully. 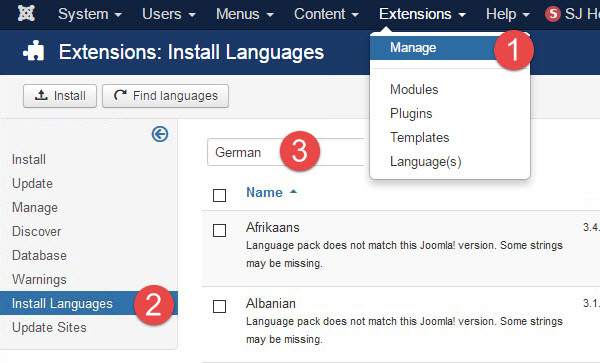 Note: There is another way to add a new language by downloading language packages on Joomla website and installing it as any other Joomla! extensions via Extension Manager. 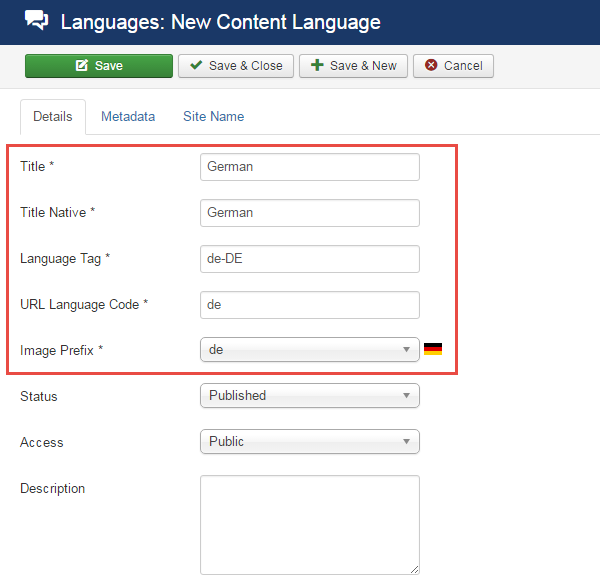 Now, you need to create new content language, please select Content Languages tab in the right sidebar menu and hit New button. Title: Name of the language. Title Native: The original language name. It will be displayed on the website front-end. 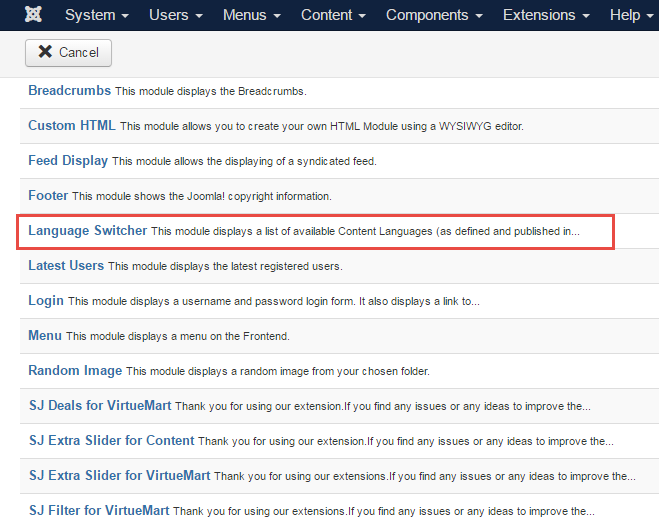 In the next step, go to Extensions >> Plugins and enable the plugin called "System - Language Filter". Status: "Enabled" for all multi-language websites. Remove URL Language Code: To create search engine friendly URLs in the multilingual site, set Remove URL Language Code to Yes. 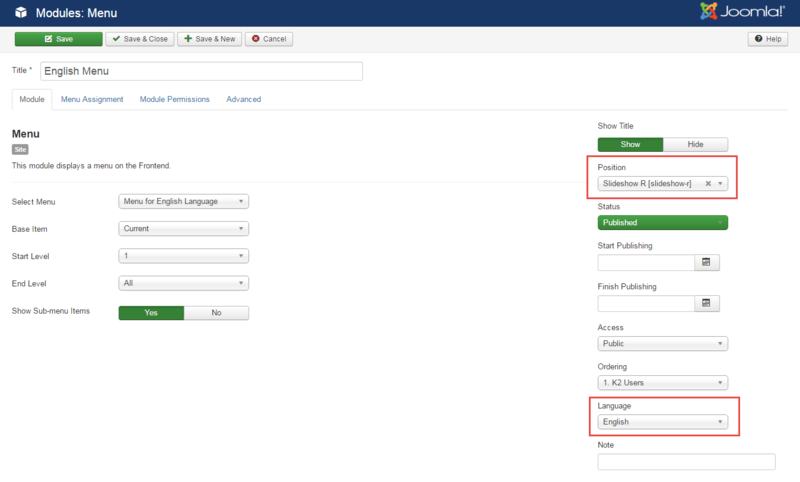 System - Language Code is built-in language code plugin of Joomla, which allows you to change the language code in the generated HTML document to improve SEO. To enable this plugin, please go to Extensions >> Plugins, search the plugin System - Language Code and switch its status to Enabled. First of all, we create a menu for both languages. Please go to Menus >> Manage >> Add New Menu. 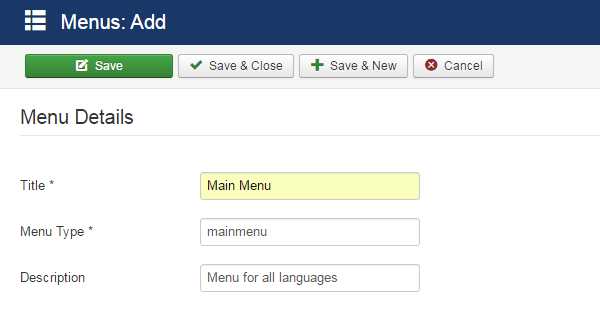 Now create other menus for the Language 1 (Menu for English Language) and Language 2 (Menu for German Language). Once everything is done properly, we should see these menus in a menu list. 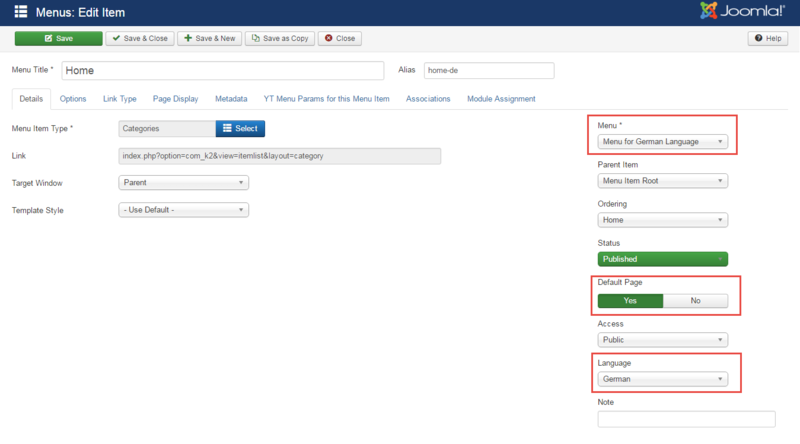 When you create a new menu in Joomla, you'll need to add a menu module to be able to display the menu on the front-end. 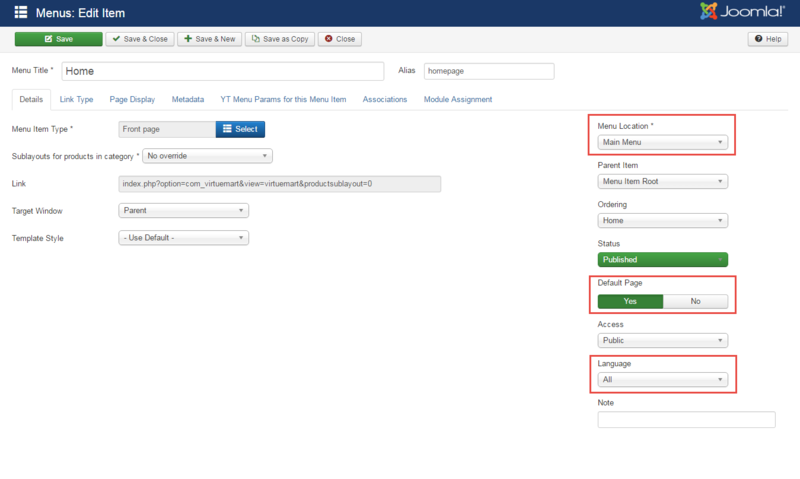 Click on Add a module for this menu type in the column Linked Modules. It will open a new Menu Module. To create a menu module for the German, just repeat the previous steps, and of course, don't forget to change the details. 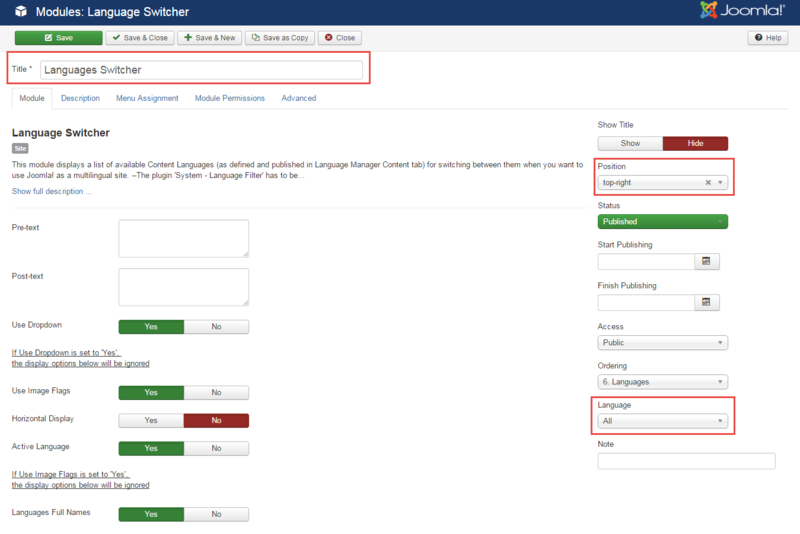 It is useful to give your visitors the option to switch between languages they want. Enter the module name, make sure its set to published, select its position (like top1, user1 etc) and click Save. We'll assign a template copy for each language. Go to Extensions >> Templates >> Styles, choose SJ Template and click on the Duplicate button. 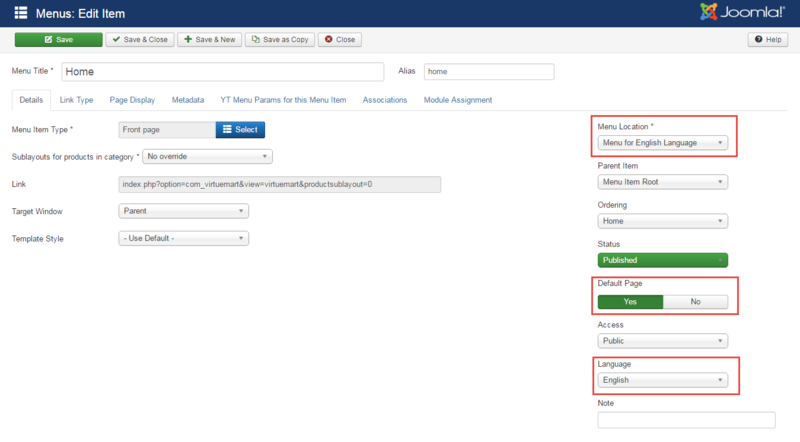 Edit the duplicated template and change the details according to each language installed. Well done! 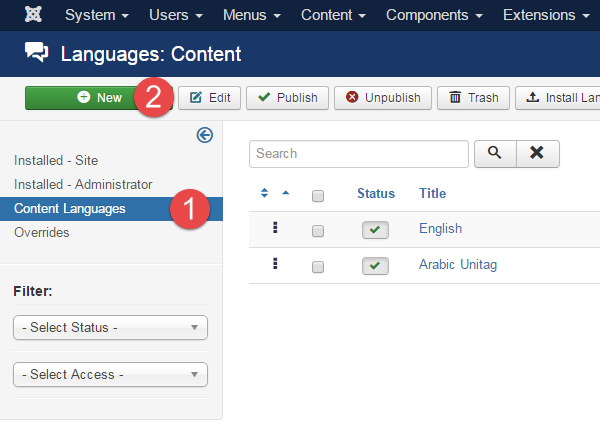 We have just shown you how to build Joomla 3 multilanguage site! If you have any questions or need further assistances, please don't hesitate to let us know via the comments box below. We are happy and ready to help you.